Given the sheer volume of DAS and NAS products it can be daunting when you actually have to buy one. And Stardom probably won’t be the first name that comes to your mind either. However what’s interesting is that these guys have been in the industry since 2000. The company has two main branches. Raidon is focussed on embedded, IPC, DVR while Stardom is focused on video editing, photo and Mac users. 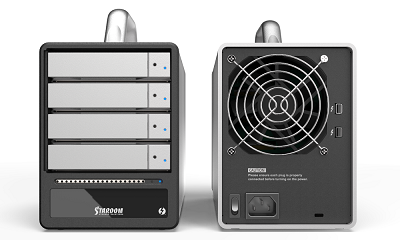 Today we look at one of their latest introductions the SohoTank ST4-TB. While there’s much debate over adaptation of Thunderbolt technology one cannot simply dismiss the performance benefits. Thunderbolt 2 promises 20GB/s transfer rates and even though Intel offered the technology to both Windows and MACs, Apple seem to have had better success with its integration. The SohoTank ST4-TB offers two Thunderbolt 2 ports for data transfer and is primarily targeted towards MAC users. Before we go further here’s a quick look at the specs of the unit.